“Today’s 100th Battalion, 442nd Infantry Regiment gold medal recognition comes as the result of contributions and sacrifices that these two made in defense of our country,” added Bruce S. Anderson, Ph.D., HHSC president and chief executive officer. 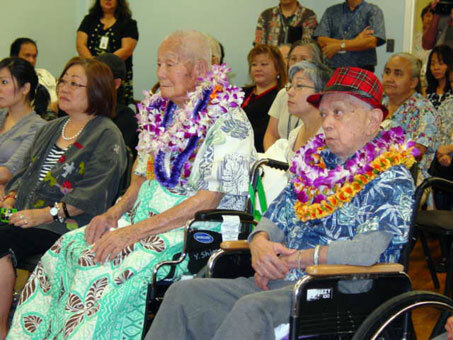 “And to finally recognize them gives HHSC, particularly our Alewa Heights long-term care facility staff a greater sense of honor in being able to respond to the present health care needs of these two veterans.” sacrifice. Yoshiwo Shimabukuro was born on December 29, 1920, in Hakalau, Hawaii Island. After graduating Hilo High School in 1937, he joined the U.S. Army. His 442nd European tour included Italy, France, and Germany. Yoshiwo was part of the 522 Field Artillery Battalion of the 442nd that entered Germany – the infamous battalion that helped to liberate Jewish survivors of the Landsberg-Kaufering Dachau Death March and Dachau sub-camps. After being discharged from military service, Yoshiwo served as a state inspector for the Board of Health and continued to be actively working even after his retirement. He has three daughters and two grandchildren. George Chinen was born on March 24, 1924, raised in Kalihi, Oahu, and graduated from Farrington High School. In 1943, at the age of 19, George enlisted in the U.S. Army and after finishing basic training at Camp Shelby, Mississippi, he was assigned to the 3rd Battalion and fought battles in both France and Italy, involving three campaigns – North Appennines, Po Valley, and Rhineland. He was discharged in December 1945, at special rank of Technical 5th grade (a special rank over corporal rank – discontinued after WWII). Mr. Chinen married Sueko Tengan in 1954 and they had three children. George was a civilian communications specialist for the federal government until his retirement in 1984. Following his retirement, he and his wife traveled extensively around the world, including frequenting Las Vegas. This is an Army Reserve unit, the only infantry unit in the entire U.S. Army Reserves. It bears the same unit designation as the one from World War Two and continues its legacy. The unit is comprised of 5 companies – two in American Samoa, one in Guam/Saipan and two on Oahu. The function of the Reserves is to supplement the active duty forces when call upon.